in the Black Hills Area. 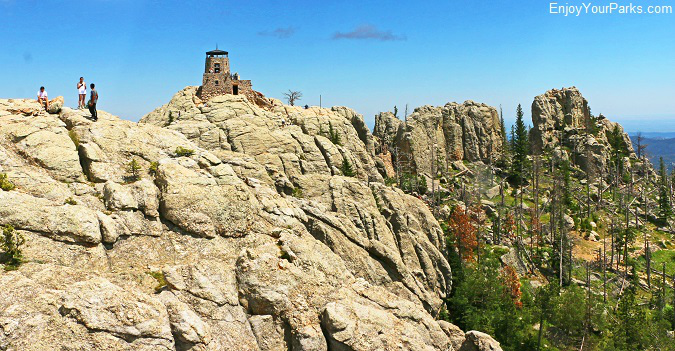 So for those of you like to hike, the Harney Peak Trail is definitely a "must do" during your South Dakota Vacation. 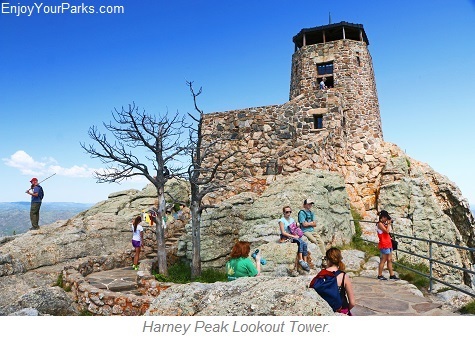 Located in the Black Elk Wilderness, Harney Peak provides a tremendous view in all directions as this mountain has over 2,900 vertical feet of prominence.... which means this peak really reaches into the sky compared to its surroundings. 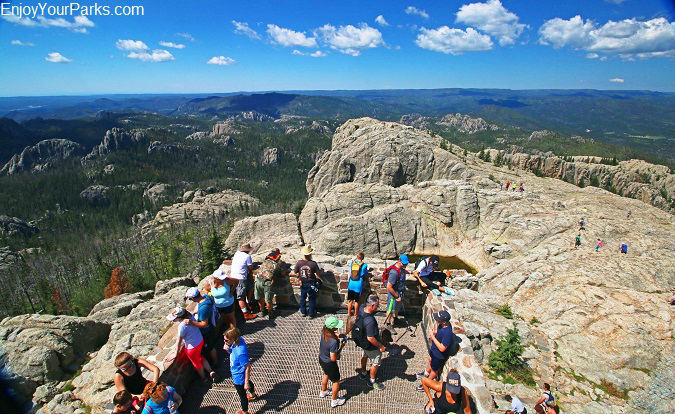 In fact, on a clear day, hikers can see 4 states from the summit of Harney Peak...which are South Dakota, Montana, Nebraska and Wyoming. And because the summit is made of solid granite with barely any vegetation present to block your view, what you will observe from the summit is absolutely breathtaking! 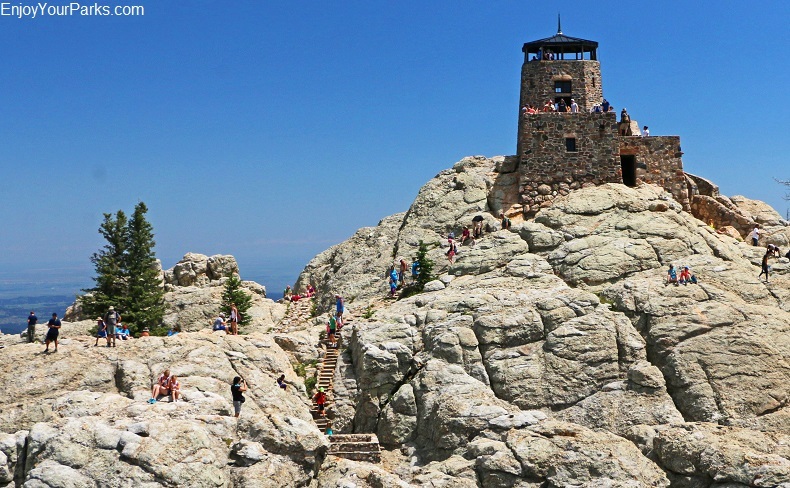 Sitting directly on the summit of Harney Peak is an old fire lookout tower made of stone, which is no longer used to watch for fires but is presently open to hikers. 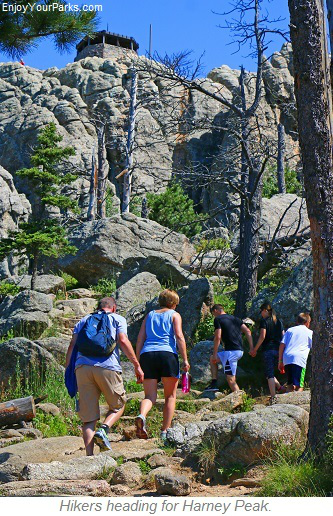 Hikers on Harney Peak in South Dakota. A view from the Harney Peak Lookout Tower. seeing in a sacred manner the shapes of all things in the spirit, and the shape of all shapes as they must live together like one being." There are two dead pine trees near the summit of Harney Peak with Native American prayer flags hanging from their branches. They ask hikers to please not disturb these prayer flags as they are sacred to the Native Americans who placed them there. 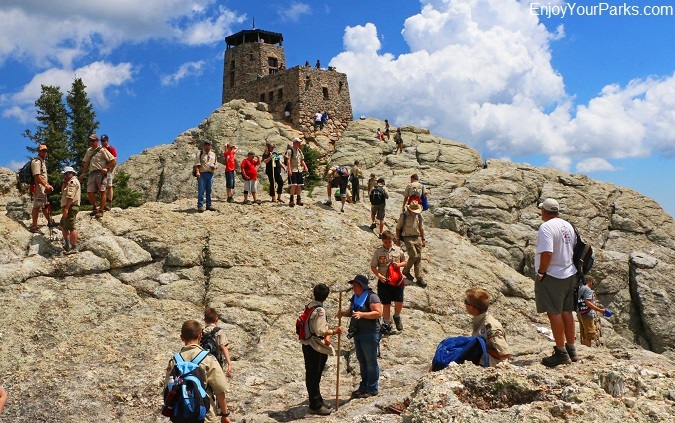 The large stone fire lookout tower standing on the summit of Harney Peak was constructed by the Civilian Conservation Corp (CCC) in 1938, which replaced the original fire tower that was built in 1920. All of the stone and cement used to build the tower was placed in 2-wheel carts and hauled up the mountain by horses and mules. Serving as a fire lookout tower until 1967, it is now used only by hikers enjoying the view from the tower's top. 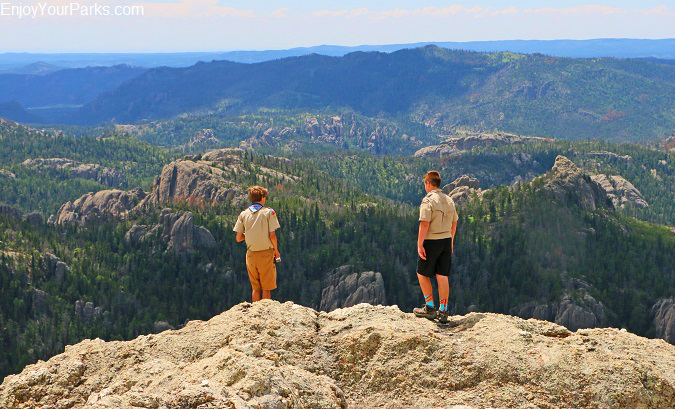 Boy Scouts enjoying the view from the summit of Harney Peak in the Black Hills of South Dakota. 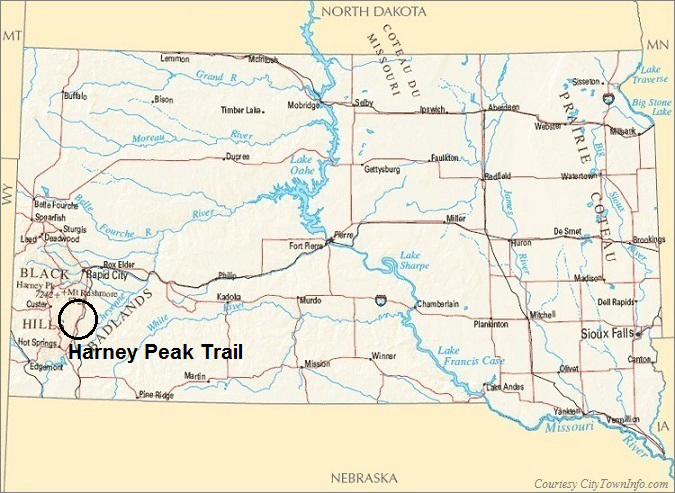 Without question the most popular trail to Harney Peak is Harney Peak Trail #9, which is located along the shore of Sylvan Lake Day Use Area in Custer State Park. 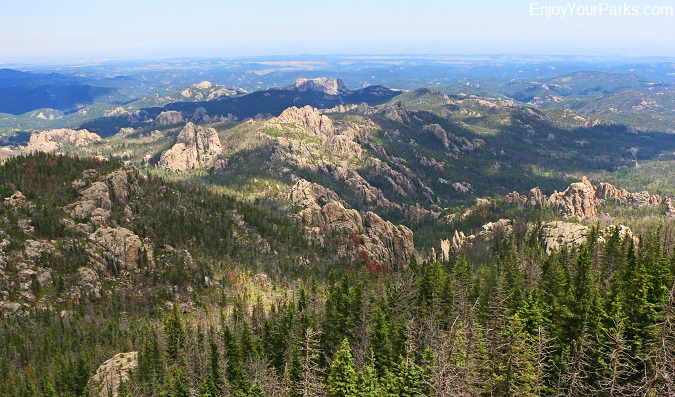 The trailhead is found next to the large parking lot along the east shore of Sylvan Lake Harney Peak Trail #9 is about 3.8 miles (one way) with a 1,000 feet of vertical elevation gain as it cuts through the Black Elk Wilderness while working its way up to the summit. Harney Peak Trail #9 is very nicely maintained and receives extremely heavy use, especially during the months of July and August, so don't expect to enjoy a quiet hike in solitude. Never-the-less, the rewarding view at the summit of Harney Peak makes putting up with the multitudes of other hikers well worth it. 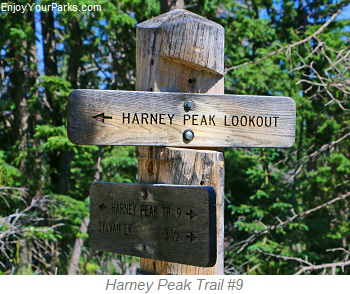 We would describe the level of difficulty of Harney Peak Trail #9 as easy to moderate, and expect to spend about 4 to 5 hours on the trail round trip. Harney Peak Trail #4 is also an extremely popular route to Harney Peak but follows a more southerly route by Cathedral Spires and Little Devils Tower. The trailhead to Harney Peak Trail #4 is also located at the large parking lot along the east shore of Sylvan Lake at the Day Use Area. 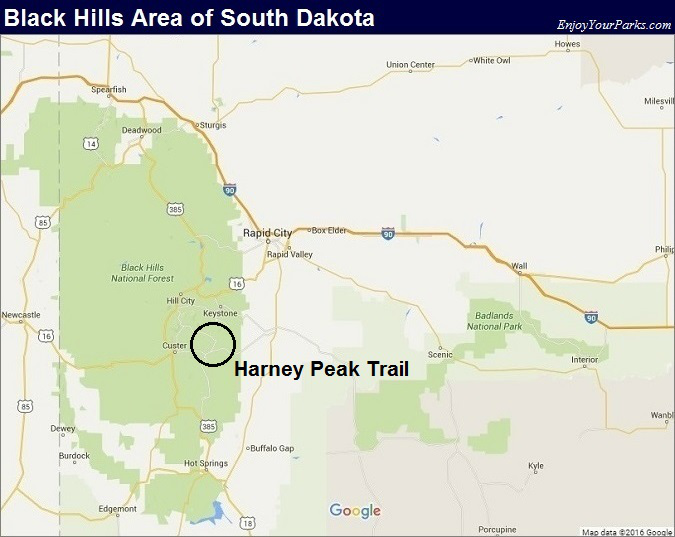 The distance to the summit of Harney Peak is again about 3.8 miles, which is the same as Harney Peak Trail #9, and of course the elevation gain is the same at about 1,000 vertical feet. Eventually, Harney Peak Trail #4 connects with Harney Peak Trail #9 at the final stretch to the summit of Harney Peak. There are numerous other trail options to Harney Peak, so if you're looking for a trail "less traveled", there's one waiting for you. The northern approach to Harney Peak from the trailhead at Willow Creek Horse Camp just off Highway 244 is not heavily used, but has twice the elevation gain (2,200 vertical feet) as the Sylvan Lake trails, and the distance is 5 miles one way. Therefore the northern approach is more difficult but some say a bit more scenic. There are several outstanding trail maps found at the Custer State Park Visitor Center or online. 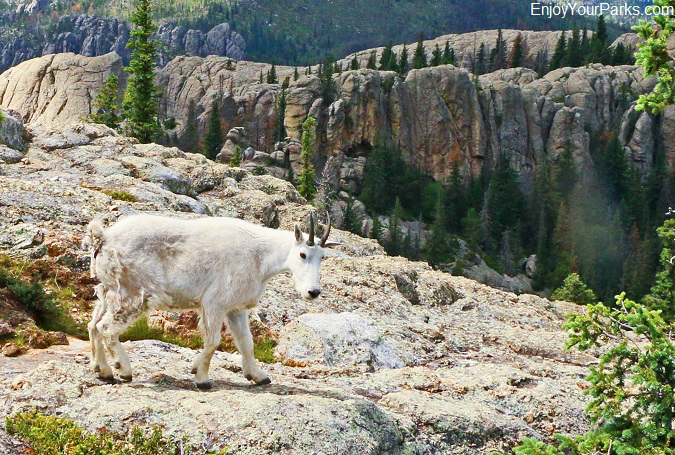 A wonderful bonus along the Harney Peak Trail is the abundant wildlife that surrounds it. Because these animals basically grew up with humans hiking on the trail, they do not seem too bothered by the throngs of hikers. Mountain goats, bighorn sheep, elk and deer are frequently seen from the Harney Peak Trail #9, so make sure to have your camera ready! Mountain Goat along the trail to Harney Peak in the Black Hills of South Dakota. View of the Black Hills from the summit of Harney Peak in South Dakota.